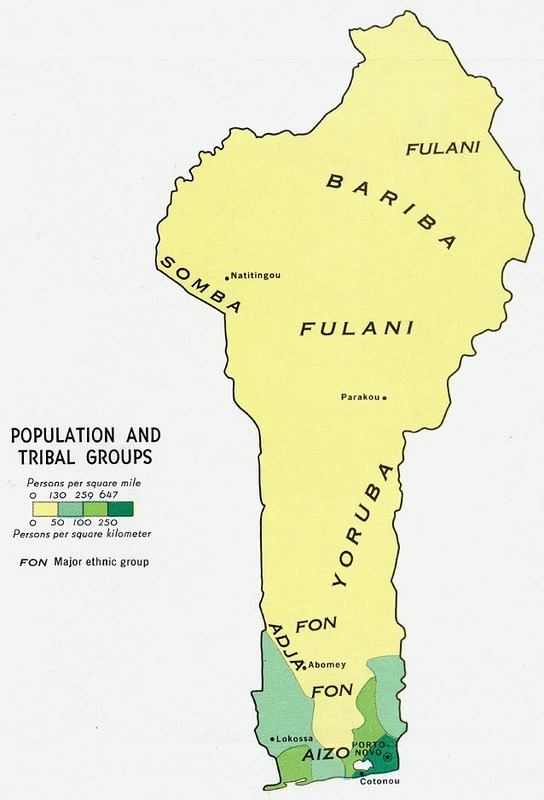 The Foodo are located in west-central Benin, Africa. Most of them live in the town of Semere, though some are also located in Gbao and Awotebi. They speak a Niger-Congo language, also called Foodo, that is related to Guang. However, they tend to use the Tem language when speaking with outsiders. For this reason, some people confuse the Foodo language as being Tem. The Foodo originated in Ghana. They immigrated to Benin and have been in the Semere region for at least 300 years. During the 1800s, they formed a close alliance with the Tem. Several people from other ethnic groups, especially the Tem, came and settled in Semere and assimilated with the Foodo. Today, the clan names of the Foodo still reflect these various ethnic origins. The Foodo region of Benin contains grasslands with rolling hills, rocky soil, and small mountain ranges. The temperatures are warm all year round. Monkeys, wild pigs, panthers, and buffalo are among the variety of animals that live there. The Foodo are primarily farmers. Yams, millet, sorghum, corn, and peanuts are their main crops. Goats, sheep, chickens, and hens are kept for their milk, wool, and meat, and to be used as sacrifices. In addition to farming, some of the Foodo engage in trade. A large number of them have also secured influential positions in government, education, and commerce. Overall, the Foodo are better off financially than some of the other groups in Benin. A Foodo meal typically includes pounded yams in a sauce, millet or corn porridge, dried fish, and sometimes beef, chicken, or goat. Hot peppers are usually added to the sauces, which consist of peanuts, green leaves, okra, and seeds. Although their nutrition level could be improved, most of the Foodo have adequate food and are not malnourished. The Foodo live in clustered villages. Village chiefs provide counsel and law for the people. If a villager does not like the chief's decisions, he can go to the police. The villagers live in houses made of mud-brick and thatch, or cement blocks. Most of their homes are rectangular and are built to form a compound. During the rainy season, some of the mud houses collapse. Termites may also destroy the thatched roofs. The Foodo normally marry outside their own clans. Most marriages are arranged by family members, but the couple also has input in the matter. Men generally marry while they are in their 20s, and most of the women marry while in their late teens. According to Islamic custom, the men may have as many as four wives. During special occasions or feasts, the Foodo enjoy singing and dancing. The beating of drums resonates from their villages during these festive times. Celebrations include weddings and the "first-yam ceremonies" held every August. Islamic feasts are also observed annually. During such occasions, the Takai ("stick dance") is performed for the men. Large drums and squeeze drums are played, and whistles are blown. Some of the dancers are decorated with shakers on their ankles. The Foodo are a friendly people who are proud of their heritage. Many want to ensure that their language does not change due to the surrounding influences. They feel they need written material in their language and opportunities for the people to learn to read and write. They also desire a youth center in their region to keep their young people from moving away from the area. The Foodo are virtually all Sunni Muslim. However, a few traditional animistic practices (based on the belief that non-living things have spirits) still persist among some. Such practices are done in secret, since animists are looked down upon by the Foodo. The Foodo need better health care facilities and qualified medical teams to treat those suffering from malaria, worms, and dysentery. Also, since many of the Foodo have a desire to preserve their language, Christian teachers and literacy workers may have the greatest opportunity to work among them. * Scripture Prayers for the Foodo in Benin. * Ask the Lord to call those who are willing to go to Benin and share Christ with the Foodo. * Pray that God will grant His wisdom and favor to missions agencies focusing on the Foodo. * Pray that Christian medical teams and teachers will have opportunities to minister Life to the Foodo. * Ask God to use the few known Foodo believers to spread the message of salvation among their friends and families. * Pray that God will open the hearts of the Foodo leaders to the Gospel. * Ask the Lord to raise up strong local churches among the Foodo.